This adorable pendant features an intricately designed, and beautifully crafted guardian angel with an adorable smile on its face. The angel measures 1 1/4" tall, and has a wingspan of 1 1/8". 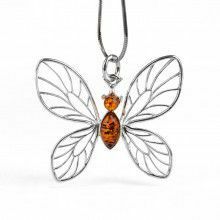 Upon its wings, complimenting an elegant pattern of sterling silver, are honey amber beads with a diameter of 1/8". 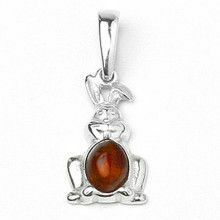 This pendant would make a great gift for any occasion! Pendant Measures: 1 1/4" 1 1/8"